To Cite: Ekici Y, Moray G. Large Duodenal Diverticula Treated by Laparoscopic Surgical Excision: A Case Report, J Minim Invasive Surg Sci. 2015 ; 4(2):e30196. doi: 10.17795/minsurgery30196. Introduction: Duodenum is the most common site for diverticular disease of small intestine. Most of duodenal diverticula are asymptomatic or have non-specific upper gastrointestinal symptoms. The complications of duodenal diverticula depend on the location and include acute diverticulitis, perforation, hemorrhage, and obstruction of the biliary or pancreatic ducts. Duodenal diverticulum can be diagnosed with upper gastrointestinal endoscopy or radiographic series. Case Presentation: In this article, we present a case report of a large duodenal diverticulum, treated with laparoscopic surgical resection. After an accurate diagnosis; treatment modality should be determined by its localization, type and size. Laparotomy is the gold standard surgical treatment of complicated duodenal diverticular disease. Conclusions: For laterally localized and protruded duodenal diverticula, laparoscopic resection is a feasible and safe method. The role of laparoscopy in surgical treatment of complicated diverticula, located in other parts of the duodenum, is unclear because of lack of experience. Copyright © 2015, Minimally Invasive Surgery Research Center and Mediterranean &amp;amp; Middle Eastern Endoscopic Surgery Association. This is an open-access article distributed under the terms of the Creative Commons Attribution-NonCommercial 4.0 International License (http://creativecommons.org/licenses/by-nc/4.0/) which permits copy and redistribute the material just in noncommercial usages, provided the original work is properly cited. Duodenum is the most common site for diverticular disease of small intestine. The incidence of duodenal diverticula (DD) is over 20% (1). DD are frequently located in the second portion of duodenum, close to the papilla (1). Most DD are asymptomatic or have non-specific upper gastrointestinal symptoms. The diagnosis of DD can be made with upper GIS endoscopy, computerised tomography (CT) scan, endoscopic retrograde cholangiopancreatography (ERCP) or plain abdominal films. The complications of DD depend on the location and include acute diverticulitis, perforation, hemorrhage, and obstruction of the biliary or pancreatic ducts. Only 5% of the patients require surgical treatment because of the complications (1). Treatment of asymptomatic and uncomplicated DD is surveillance (1). Effective treatment of symptomatic DD is simple diverticulectomy, but alternative procedures have been described according to the location of the diverticulum. A 56-year-old female was admitted to the hospital with complaints of intermittent epigastric and right upper quadrant abdominal pain irradiating to the back, nausea, emesis and diarrhea episodes for three months. She had diabetes treated with metformin and the diabetes was controlled. Her family history was unremarkable and she had no history of previous abdominal surgery. Physical examination presented normal bowel sounds with a non-tender, loose abdomen and blood tests were in normal ranges. Upper gastrointestinal endoscopic examination revealed pangastritis with chronic inflammation of the duodenum without any specific pathology. There was a large DD with a large mouth on the second part of the duodenum. The diverticulum contained food and food residues. 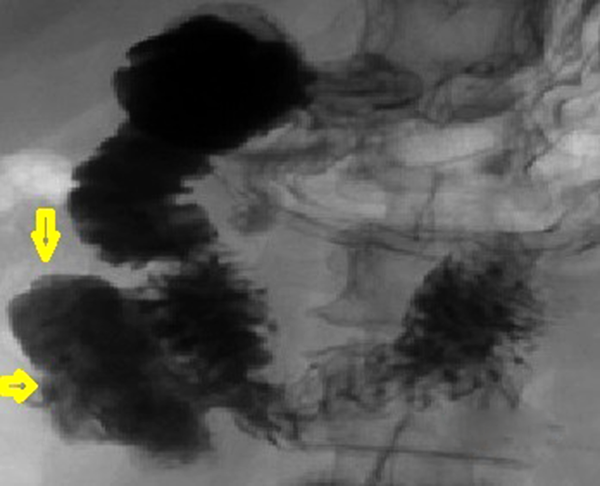 Gastrointestinal barium study showed a 5-cm protruding DD on the lateral wall of the second part of the duodenum (Figure 1). The operation was done under general anesthesia in supine position with her arms extended to sides. As the first step, abdominal access was obtained above the umbilicus with Veress needle. We created a 12-mmHg intra-abdominal pressure by insufflation of carbon dioxide (CO2) with the Veress needle. Following proper distension of the abdominal cavity, a 10-mm trocar was inserted above the umbilicus. One 5-mm and one 12-mm (right and left subcostal sides) trocars were placed symmetrically on the paramedian line at subcostal level. Another 5-mm trocar was placed on pararectal line at the half way of the umbilical and subcostal trocars. A 30-degree, 10-mm camera was used for intraoperative visualization. As the abdomen was explored, normal abdominal structures were seen, but we were not able to visualize the DD at that moment. The first step of the dissection was finding the pylorus. After that, the gastrocolic omentum was raised and divided using a 5-mm laparoscopic Ligasure device (Covidien) to enter the lesser sac. Transvers colon and hepatic flexure were mobilized, the transvers mesocolon was identified and colonic vasculature was protected. Following the duodenum from pylorus to distal, allowed us to easily perform the kocherisation of the duodenum. Thus, we confirmed that there was a large DD protruding laterally between the border of the second and the third duodenal parts (Figure 2). 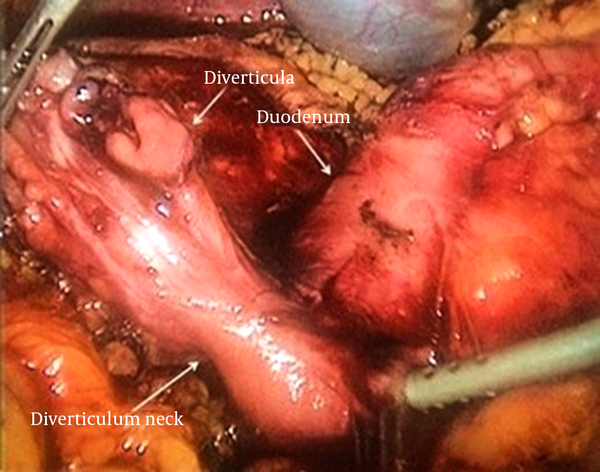 The diverticulum was dissected until it was fully freed from surrounding tissues. We saw a protruding type pseudodiverticulum composed of mucosa and submucosa. The position of the stapler was perpendicular to the long axis of the duodenum to avoid narrowing of the duodenum. It was fired and the DD was resected and removed out of the abdomen. The diverticular neck and the site of protrusion were clearly visualized. The diverticulum was perforated during the dissection from the top of the sac. There was no spillage to the abdominal cavity. An endostapler (Ethicon) blue 45-mm laparoscopic stapler was placed to the neck of the diverticulum. There was an oozing type bleeding from the resection site. We sewed the stump with a 3/0 Ethibond (Ethicon) suture. A nasogastric tube was placed to the duodenum and leak test was performed. We insufflated air through the nasogastric tube into the lumen and filled the diverticulum excision site with saline. We decided to finish the operation when there were no bubbles seen in the saline (leaking air from the excision site). A subhepatic 16 French drain was placed and removed on the second postoperative day. The 10- and 15-mm trocar holes were closed with fascial sutures of 2-0 Prolene (Ethicon). The operation lasted for 95 minutes. The patient was discharged on the fourth postoperative day without any complications. She was symptom-free and had no complications during six months of follow-up. DD are frequently located at the papilla or near the papilla (70%) (1). In this case, the DD was in the second part of the duodenum on the lateral wall. The incidence of lateral diverticula in the second part of the duodenum is 3% (1). It predominantly occurs in women. DD is generally an acquired disease; it is rarely seen in patients before the 4th decade of life. Usually, duodenal diverticula are asymptomatic or have nonspecific symptoms, including abdominal pain located in epigastrium or right upper abdomen, nausea, vomiting, and diarrhea. Accumulation of food in the diverticula or diverticular bezoar formation may be the possible causes of symptoms. This may lead to blind loop syndrome. Bezoar formation is remarkable in bigger duodenal diverticula like in this case. Moreover, adenocarcinoma is reported to develop from duodenal diverticulum (2). The clinical presentation of the disease differs when DD is complicated (perforation, hemorrhage, bile duct or pancreatic duct obstruction). Asymptomatic types of DD are commonly diagnosed incidentally during upper gastrointestinal endoscopy. Upper gastrointestinal barium meal reveals the diverticula that can be missed in the initial endoscopy. However MR, CT and ERCP can help diagnose diverticula. Only 1% - 5% of DD are complicated and it is difficult to diagnose a complicated diverticulitis (1). It is not easy to make an accurate diagnosis of DD before surgery because of the complex anatomy of the duodenal region. It is difficult to make differential diagnosis of pancreatic pathologies, when there is a mass in imaging, especially in the second part of the duodenum. There are several case reports of such patients. It is quite important to make the accurate diagnosis, as the type of the surgery, especially laparoscopy, depends much more on this diagnosis. In this case, a large DD was observed with duodenitis and nonspecific gastrointestinal symptoms. Upper gastrointestinal endoscopy incidentally showed DD. In such cases, there may be bezoar formation and bezoar related complications (obstruction, perforation, diverticulitis, blind loop syndrome, etc.). The location and type of DD affect the treatment choice. The cause of perforation is food accumulation and digestion process in 57% of DD cases (3). Perforation of DD is an important complication, with mortality rate of 30% (4). Asymptomatic, incidentally diagnosed DD cases do not require surgery, unless it is outside duodenum. Protruding DD can be surgically resected without making a duodenotomy. Although different types of surgical treatment are described, conventional or laparoscopic surgical resection of symptomatic DD seems to be the best option (5). Surgical intervention in this area has high postoperative morbidity and mortality (6). The mortality rate after surgical diverticulectomy is reported at 30%. Late diagnosis or misdiagnosis causes perforation with a mortality rate of 90% (7). Laparoscopy is the preferred type of surgery for abdominal operations. The advantages of laparoscopic operations (less postoperative pain, better cosmetic results, shorter hospital stay, etc.) are widely accepted. The only disadvantage of laparoscopic surgery is the need for an experienced surgeon. There are two case reports about laparoscopic resection of DD. Both of them reported the laparoscopic procedure feasible and safe (8, 9). After an accurate diagnosis, the choice of surgery depends on the location, type and size of the DD. It is easy to reach laterally located and protruding DD, as in this case, but it is relatively difficult to access the other parts of the duodenum with laparoscopy because of lack of laparoscopic experience. We used four trocars (as stated before). Protruding type of DD has perforation risk, because the diverticulum’s wall consists only of mucosa and the wall is exposed to irritation from bezoar formation and digestive irritation. After careful dissection of the diverticulum neck, one should be careful about not to narrow the duodenal lumen. Laparoscopic excision of duodenal diverticula is feasible and safe.